It’s always fun when Nancy Berk stops by to chat. In this episode we talked about her book College Bound and Gagged: How to Help Your Kid Get into a Great College Without Losing Your Savings, Your Relationship, or Your Mind making a cameo in the film Admission. We talked about her new column for Parade Magazine called “Showbiz Analysis” and we talked about the fun celebrity interviews she is doing on Whine At 9. 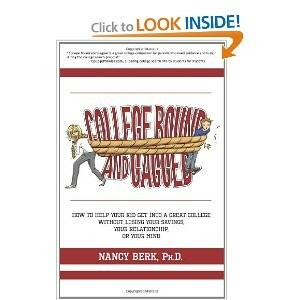 For more of this fast-paced conversation tune in by clicking on Nancy’s name below her book cover.